New publication: Zararsiz G., Zararsiz GE., Ozturk A., Göksülük, D., Korkmaz S., Eldem V., Karaca H. and Tasci T. (2017). Genome Wide Gene Expression Profiling and Molecular Classification of Renal Cell Cancer Subtypes. Journal of Advances in Information Technology, 8(1). Clickfor details. New publication: Zararsiz G, Akyildiz HY, Goksuluk D, Korkmaz S, Ozturk A. Statistical learning approaches in diagnosing patients with nontraumatic acute abdomen. Turkish Journal of Electrical Engineering and Computer Sciences, 24(5):3685–3697. Clickfor details. New publication: Goksuluk D, Korkmaz S, Zararsiz G, Karaagaoglu AE. 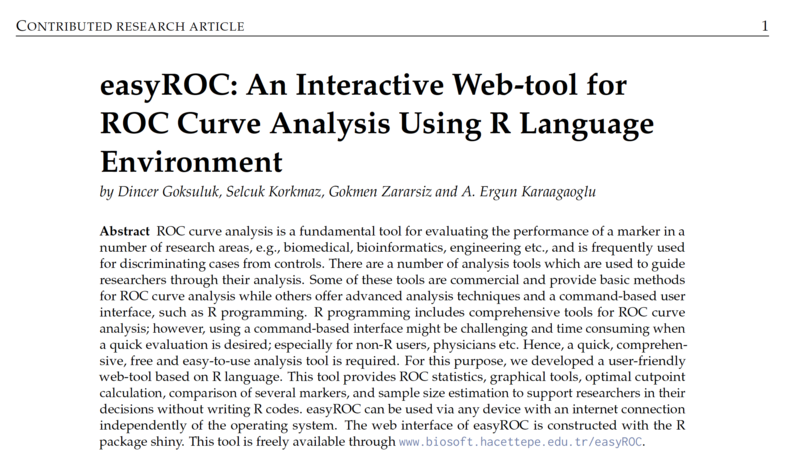 easyROC: An interactive web-tool for ROC curve analysis using R language environment. R Journal, 8(2):213-230. Clickfor details. New publication: Zararsiz G, Korkmaz S, Goksuluk D, Eldem V, and Ozturk A. (2015). 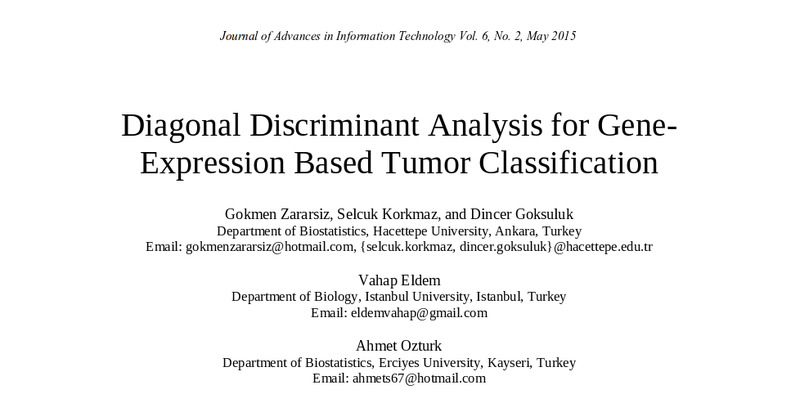 Diagonal Discriminant Analysis for Gene-Expression Based Tumor Classification. Journal of Advances in Information Technology, 6(2), 59-62. Clickfor details. New publication: Akkaya N., Yılancı H. Ö., Goksuluk D. (2015). Applicability of Demirjian’s four methods and Willems method for age estimation in a sample of Turkish children. Legal Med, http://dx.doi.org/10.1016/j.legalmed.2015.04.003. Clickfor details. New publication: Korkmaz S, Zararsiz G and Goksuluk D (2015). 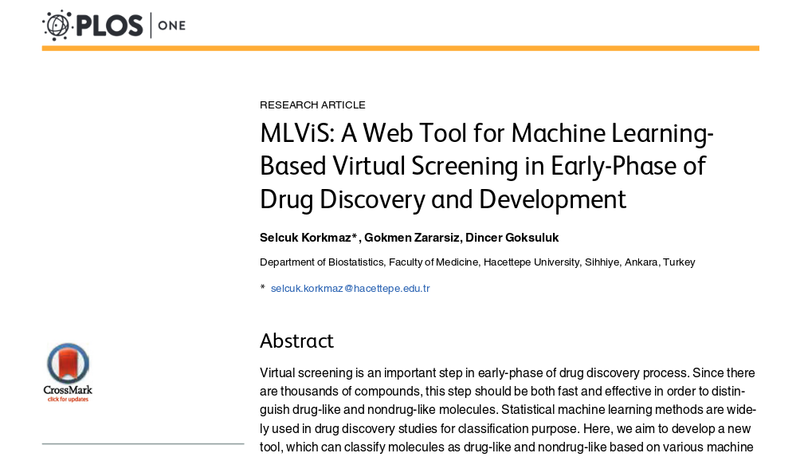 MLViS: A Web Tool for Machine Learning-Based Virtual Screening in Early-Phase of Drug Discovery and Development. PLoS ONE 10(4): e0124600. doi: 10.1371/journal.pone.0124600.Click for details. Dincer Goksuluk was graduated from Statistics in 2008 and completed his master degree in Statistics in 2011. He has been studying his Combined Phd education in Hacettepe University, Department of Biostatistics. He also works in the same department as a Research Assistant. Dincer Goksuluk's reasearches are related with "multivariate statistics, longitudinal data analysis, categorical data analysis, design of experiments and longitudinal data analysis" in Statistics. He also specialized in "next generation sequencing, RNA-Sequencing, microarray, transcriptomics and proteomics" in Bioinformatics. I have started my PhD education in 2012. I am now working on Negative Binomial classifiers as a PhD dissertation. I have completed master degree in Statistics in Dokuz Eylül University, İzmir. My master thesis was about Penalized Logistic Regression. I work in Hacettepe University, Dept. of Biostatistics since 2012. The paper titled "compSurv: An interactive web-tool for survival analysis." is awarded as "Selected Presentation (3rd place)" by 1st International Biostatistics Congress. The paper titled "Diagonal Discriminant Analysis for Gene-Expression Based Tumor Classification" is awarded as "Best Oral Presentation" by 3rd International Conference on Bioinformatics and Computational Biology (ICBCB 2015). The paper titled "Travma dışı akut karınlı hastaların tanısında istatistiksel öğrenme yöntemleri" is awarded as "Best Oral Presentation" by Erciyes University. The paper titled "Yeni nesil dizileme sistemleri için veri madenciliği aracı" is awarded as "Best Oral Presentation" by Erciyes University. The research titled "Classification of RNA-Seq data via bagging support vector machines" is awarded in a Conference organized by International Biometric Society (IBS) in Italy. The related work is selected as "best paper among studies from Asia Continent" and presented in special session. 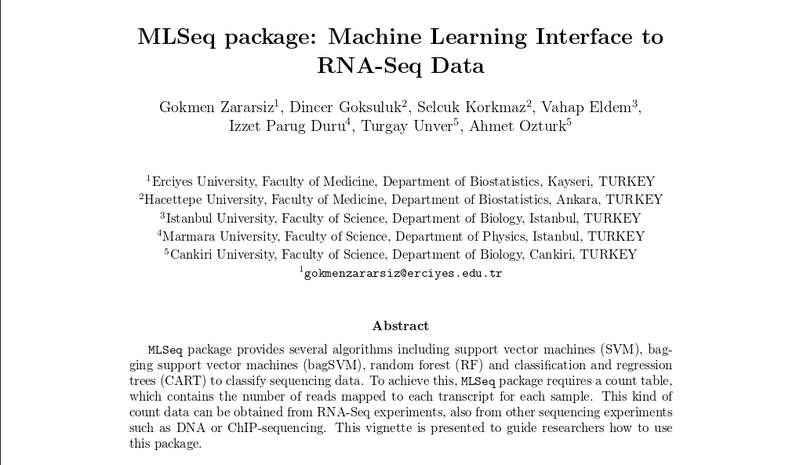 The research titled "RNA-dizileme verileri ile gen ekspresyonuna dayalı sınıflandırmada yeni bir yaklaşım ve MLSeq R/Bioconductor yazılımı" is awarded in a National Conference organized by Biostatistics Society in Turkey. The related work is selected as "best oral presentation". A preliminary study of dental patterns in panoramic radiography for forensic identification. The purposes of this preliminary study were to define dental parameters in panoramic radiographs to generate dental patterns for forensic identification, to evaluate intra- and inter-observer effects on the assessment of these parameters, and to determine the optimum number of parameters to be used in dental coding for diversity studies. Fingerprints, DNA, and dentition are the principal markers used for forensic identification. Frequently used dental characteristics for identification include evidence of dental procedures, such as restorations, root canal therapy, crowns, and extractions. The purposes of this preliminary study were to define dental parameters in panoramic radiographs to generate dental patterns for forensic identification, to evaluate intra-and inter-observer effects on the assessment of these parameters, and to determine the optimum number of parameters to be used in dental coding for diversity studies. In total, 11 dental parameters (virgin, missing, filling, crown, defect, residual root, bridge pontic, dental implant, endodontic treatment, impacted, and dental anomaly) were defined and the details of the coding were shown. Based on the definition of the specified parameters, dental patterns were determined from 169 panoramic radiographs. Overall, intra-and inter-observer agreements were 97.48% and 94.48%, respectively. The effects of each parameter on diversity were evaluated. When 4 and 6 base parameters and all 11 parameters were used, the diversities for full dentition were 99.31%, 99.95%, and 99.95% respectively. It was concluded that from panoramic radiographs with the 11 specified parameters, an optimum number of 6 parameters (virgin, missing, filling, crown, defect, and impacted) can be used readily and reliably to study the diversity of dental patterns for forensic identification. Genome Wide Gene Expression Profiling and Molecular Classification of Renal Cell Cancer Subtypes. In this study, our aim is to identify biomarker candidates expressed at different levels between subtypes of RCC for potential new therapy for RCC. 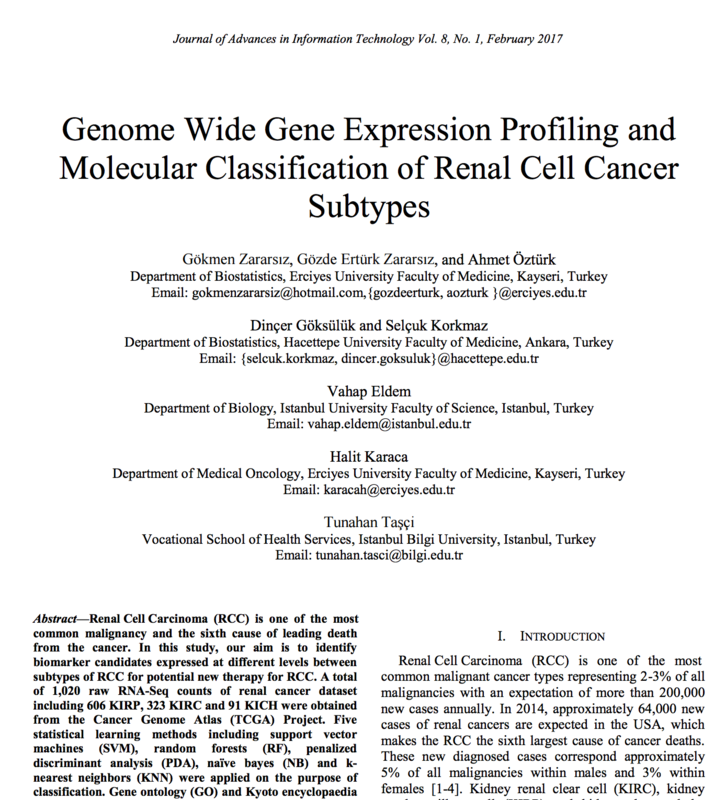 Journal Paper Zararsiz G., Zararsiz GE., Ozturk A.,Göksülük, D.,Korkmaz S., Eldem V., Karaca H. and Tasci T.
Renal Cell Carcinoma (RCC) is one of the most common malignancy and the sixth cause of leading death from the cancer. In this study, our aim is to identify biomarker candidates expressed at different levels between subtypes of RCC for potential new therapy for RCC. A total of 1,020 raw RNA-Seq counts of renal cancer dataset including 606 KIRP, 323 KIRC and 91 KICH were obtained from the Cancer Genome Atlas (TCGA) Project. Five statistical learning methods including support vector machines (SVM), random forests (RF), penalized discriminant analysis (PDA), naive bayes (NB) and k- nearest neighbors (KNN) were applied on the purpose of classification. Gene ontology (GO) and Kyoto encyclopaedia of genes and genomes (KEGG) pathway analysis were also conducted for a deeper understanding of differentially expressed genes in three renal cancer subtypes. easyROC is a web-tool which guides researchers through their ROC curve analysis. It can be used via any device with internet connection. Journal Paper Programming Göksülük, D., Korkmaz, S., Zararsız, G., Karaağaoğlu, AE. This web application creates ROC curves, calculates area under the curve (AUC) values and confidence intervals for the AUC values, and performs multiple comparisons for ROC curves in a user-friendly, up-to-date and comprehensive way. Click here for the web-tool. Statistical learning approaches in diagnosing patients with nontraumatic acute abdomen. In this paper, various statistical learning algorithms are considered for diagnosing nontraumatic acute abdomen. The model performances are assessed using several measures and selected algorithms are used to build an interactive web-tool for diagnosing purpose. Journal Paper Programming Zararsiz G, Akyildiz HY, Goksuluk D, Korkmaz S, Ozturk A. A quick evaluation is required for patients with acute abdominal pain. It is crucial to differentiate between surgical and nonsurgical pathology. Practical and accurate tests are essential in this differentiation. Lately, D-dimer level has been found to be an important adjuvant in this diagnosis and obviously outperforms leukocyte count, which is widely used for diagnosis of certain cases. Here, we handle this problem from a statistical perspective and combine the information from leukocyte count with D-dimer level to increase the diagnostic accuracy of nontraumatic acute abdomen. For this purpose, various statistical learning algorithms are considered and model performances are assessed using several measures. Our results revealed that the naive Bayes algorithm, robust quadratic discriminant analysis, bagged and boosted support vector machines, and single and bagged k-nearest neighbors provide an increase in diagnostic accuracies of up to 8.93% and 17.86% compared with D-dimer level and leukocyte count, respectively. Highest accuracy was obtained as 78.57% with the naive Bayes algorithm. Analysis has been done via the R programming language based on the codes developed by the authors. A user-friendly web-tool is also developed to assist physicians in their decisions to differentially diagnose patients with acute abdomen. It is available at http://www.biosoft.hacettepe.edu.tr/DDNAA/. MVN is an R package which performs multivariate normality tests and graphical approaches and implements multivariate outlier detection and univariate normality of marginal distributions through plots and tests. 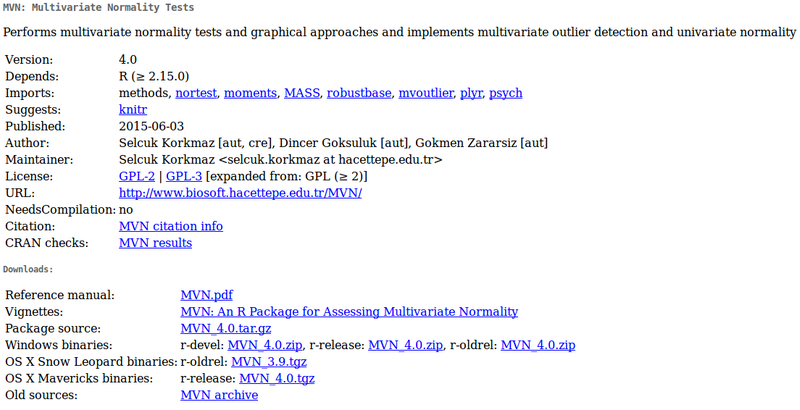 Manual Programming Korkmaz, S., Göksülük, D., Zararsız, G.
MVN is an R package which performs multivariate normality tests and graphical approaches. It implements multivariate outlier detection and univariate normality of marginal distributions through plots and tests. The package is regularly maintained as new methods are developed or current methods are modified. Click here for package repository from CRAN. Manual Programming Zararsız, G., Göksülük, D., Korkmaz, S., et. al. MLSeq package provides several algorithms including support vector machines (SVM), bagging support vector machines (bagSVM), random forest (RF) and classification and regression trees (CART) to classify sequencing data. To achieve this, MLSeq package requires a count table, which contains the number of reads mapped to each transcript for each sample. This kind of count data can be obtained from RNA-Seq experiments, also from other sequencing experiments such as DNA or ChIP-sequencing. This vignette is presented to guide researchers how to use this package. Journal Paper Zararsız, G., Korkmaz, S., Göksülük, D., et. al. A reliable and accurate tumor classification is crucial for successful diagnosis and treatment of cancer diseases. With the recent advances in molecular genetics, it is possible to measure the expression levels of thousands of genes simultaneously. Thus, it is feasible to have a complete understanding the molecular markers among tumors and make a more successful and accurate diagnosis. A common approach in statistics for classification is linear and quadratic discriminant analysis. However, the number of genes (p) is much more than the number of tissue samples (n) in gene expression datasets. This leads to data having singular covariance matrices and limits the use of these methods. Diagonal linear and diagonal quadratic discriminant analyses are more recent approaches that ignore the correlation among genes and allow high-dimensional classification. Nearest shrunken centroids algorithm is an updated version of diagonal discriminant analysis, which also selects the genes that mostly contributed in class prediction. In this study we will discuss these algorithms and demonstrate their use both in microarray and RNA sequencing datasets. Journal Paper Akkaya, N., Yılancı, H.Ö., Göksülük, D.
The aim of this study was to evaluate applicability of five dental methods including Demirjian’s original, revised, four teeth, and alternate four teeth methods and Willems method for age estimation in a sample of Turkish children. Panoramic radiographs of 799 children (412 females, 387 males) aged between 2.20 and 15.99 years were examined by two observers. A repeated measures ANOVA was performed to compare dental methods among gender and age groups. All of the five methods overestimated the chronological age on the average. Among these, Willems method was found to be the most accurate method, which showed 0.07 and 0.15 years overestimation for males and females, respectively. It was followed by Demirjian’s four teeth methods, revised and original methods. 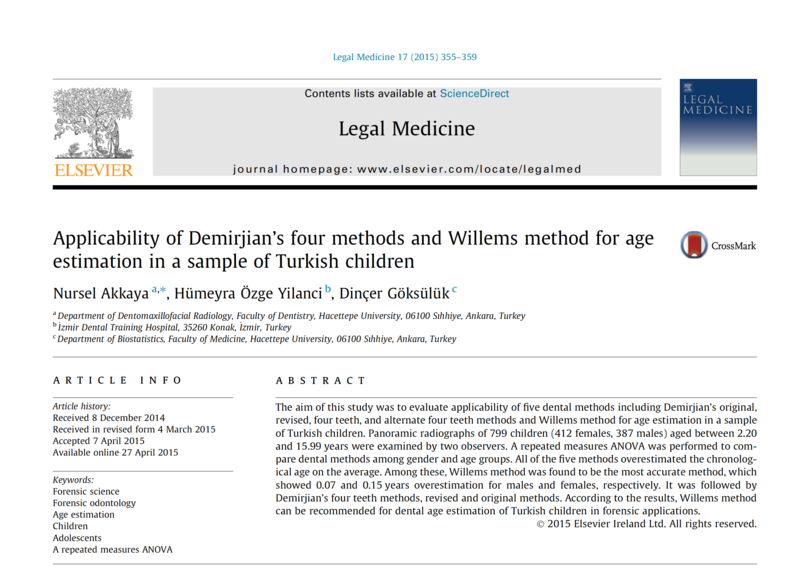 According to the results, Willems method can be recommended for dental age estimation of Turkish children in forensic applications. 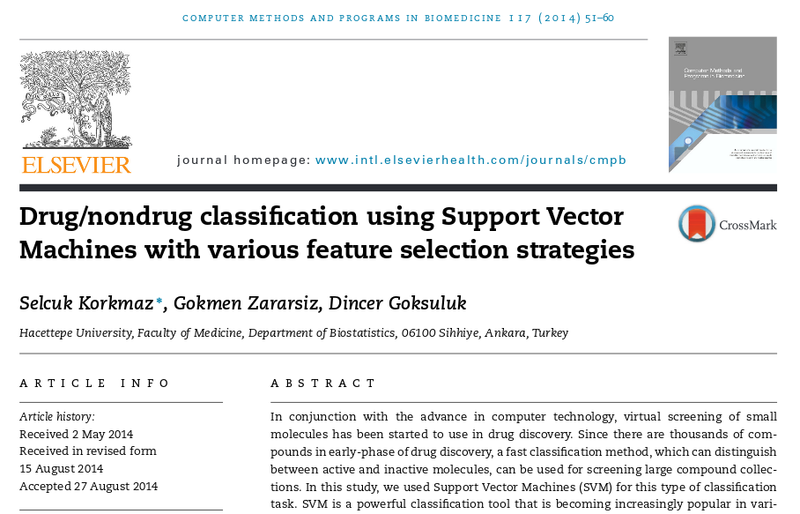 Journal Paper Korkmaz, S., Zararsız, G., Göksülük, D.
Virtual screening is an important step in early-phase of drug discovery process. Since there are thousands of compounds, this step should be both fast and effective in order to distinguish drug-like and nondrug-like molecules. Statistical machine learning methods are widely used in drug discovery studies for classification purpose. Here, we aim to develop a new tool, which can classify molecules as drug-like and nondrug-like based on various machine learning methods, including discriminant, tree-based, kernel-based, ensemble and other algorithms. To construct this tool, first, performances of twenty-three different machine learning algorithms are compared by ten different measures, then, ten best performing algorithms have been selected based on principal component and hierarchical cluster analysis results. Besides classification, this application has also ability to create heat map and dendrogram for visual inspection of the molecules through hierarchical cluster analysis. 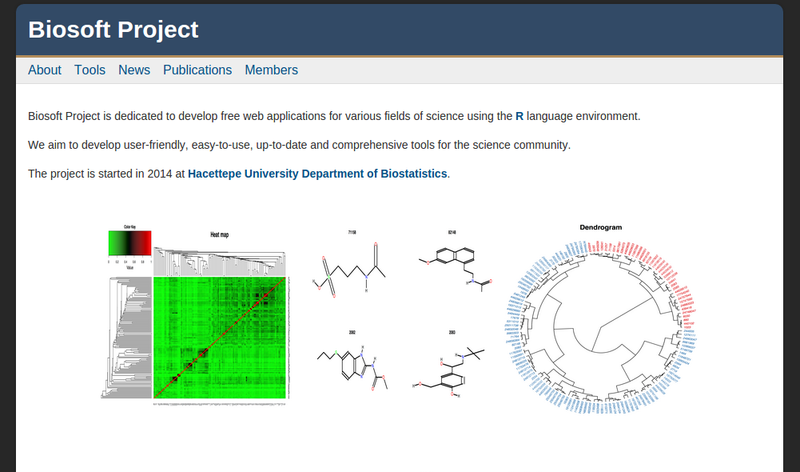 Moreover, users can connect the PubChem database to download molecular information and to create two-dimensional structures of compounds. This application is freely available through www.biosoft.hacettepe.edu.tr/MLViS/. In conjunction with the advance in computer technology, virtual screening of small molecules has been started to use in drug discovery. Since there are thousands of compounds in early-phase of drug discovery, a fast classification method, which can distinguish between active and inactive molecules, can be used for screening large compound collections. In this study, we used Support Vector Machines (SVM) for this type of classification task. SVM is a powerful classification tool that is becoming increasingly popular in various machine-learning applications. The data sets consist of 631 compounds for training set and 216 compounds for a separate test set. In data pre-processing step, the Pearson's correlation coefficient used as a filter to eliminate redundant features. After application of the correlation filter, a single SVM has been applied to this reduced data set. Moreover, we have investigated the performance of SVM with different feature selection strategies, including SVM–Recursive Feature Elimination, Wrapper Method and Subset Selection. All feature selection methods generally represent better performance than a single SVM while Subset Selection outperforms other feature selection methods. We have tested SVM as a classification tool in a real-life drug discovery problem and our results revealed that it could be a useful method for classification task in early-phase of drug discovery. Journal Paper Korkmaz, S., Göksülük, D., Zararsız, G.
Assessing the assumption of multivariate normality is required by many parametric multivariate statistical methods, such as MANOVA, linear discriminant analysis, principal component analysis, canonical correlation, etc. It is important to assess multivariate normality in order to proceed with such statistical methods. There are many analytical methods proposed for checking multivariate normality. However, deciding which method to use is a challenging process, since each method may give different results under certain conditions. Hence, we may say that there is no best method, which is valid under any condition, for normality checking. In addition to numerical results, it is very useful to use graphical methods to decide on multivariate normality. Combining the numerical results from several methods with graphical approaches can be useful and provide more reliable decisions. 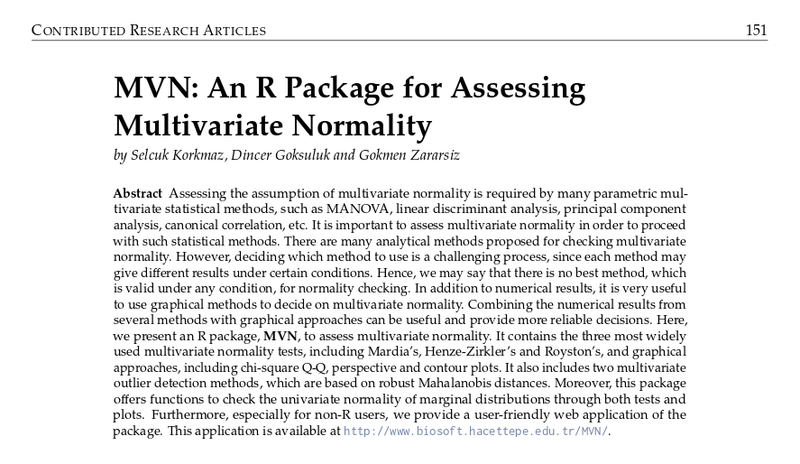 Here, we present an R package, MVN, to assess multivariate normality. It contains the three most widely used multivariate normality tests, including Mardia’s, Henze-Zirkler’s and Royston’s, and graphical approaches, including chi-square Q-Q, perspective and contour plots. It also includes two multivariate outlier detection methods, which are based on robust Mahalanobis distances. Moreover, this package offers functions to check the univariate normality of marginal distributions through both tests and plots. Furthermore, especially for non-R users, we provide a user-friendly web application of the package. This application is available at http://www.biosoft.hacettepe.edu.tr/MVN/. 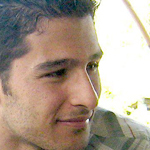 Gökmen Zararsız has completed his PhD. in Biostatistics, Hacettepe University, Ankara - TURKEY. Currently, he works in Erciyes University, Kayseri - Turkey. His main working areas include next-generation sequencing data analysis, machine learning, genomics and transcriptomics. He is a research assistant in Biostatistics department of Hacettepe University. His main research areas are proteomics, drug discovery, virtual screening and machine learning. S.K. worked in University of California, San Diego Supercomputing Center with the project on developing new approaches for the prediction of biological assemblies and protein-protein interfaces. The aim of this project is to develop novel approaches for the classification of RNA-Seq data. RNA-Seq uses the advantages of new generation sequencing technology and produces the count data which are the expression level of genes. The gene expression data will be trained by statistical learning algorithms. Next, trained models will be used to predict the unknown class label of new samples. The developed algorithms will be provided with an easy-to-use and up-to-date web-tool to help researchers in their analysis. 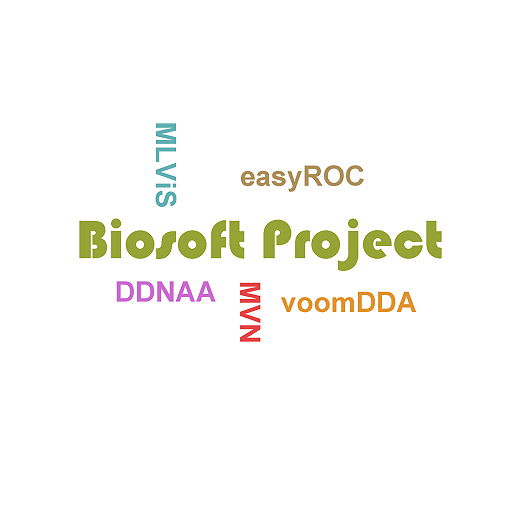 Biosoft Project is dedicated to develop free web applications for various fields of science using the R language environment. We aim to develop user-friendly, easy-to-use, up-to-date and comprehensive tools for science community. The project is started in 2014 at Hacettepe University, Department of Biostatistics. For detailed information, see Works section. Biostatistics. Faculty of Health Sciences, Department of Child Development. Biostatistics. Faculty of Dentistry, Senior Class. While I mainly use R for data analysis, i am well experienced on other tools such as SPSS, Matlab, Mapple, Orange, etc. Although TeX is my first choice, I use both TeX engine and MS Office products for my academic publications and presentations. I am an amateur scuba diver certified by Scuba Diving International (SSI). I am also interested in Photography and Tennis. The complete list of web-tools and packages can be found here.